Preheat oven to 220°C (425°F). Place the broccoli, oil, chilli, almond, salt and pepper in a large bowl and toss to combine. Place the broccoli mixture on a large oven tray lined with non-stick baking paper and cook for 6–8 minutes or until tender and charred. 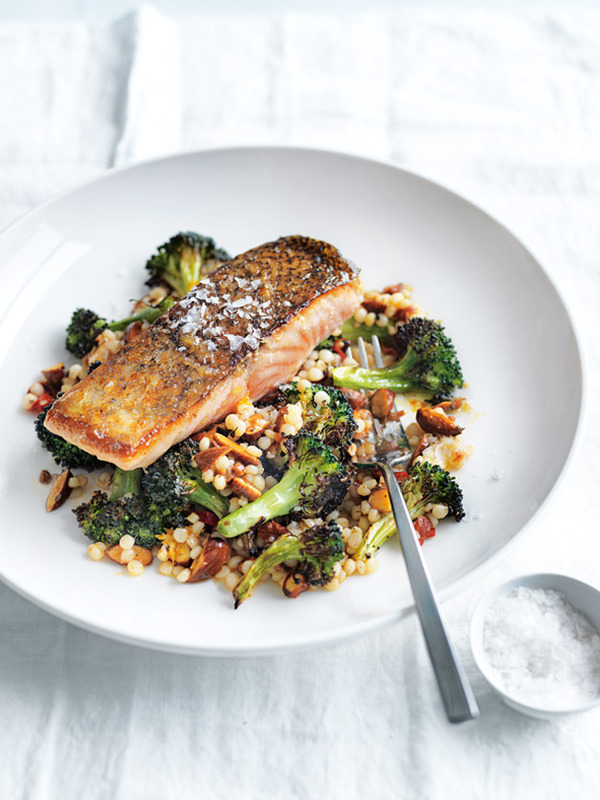 Sprinkle the salmon with salt and pepper and place on top of the broccoli. Cook for a further 8–10 minutes or until the salmon is just cooked through. Place the couscous, pesto, lemon rind, lemon juice and broccoli mixture in a large bowl and mix to combine. Divide the mixture between serving plates and top with the salmon. Sprinkle with sea salt to serve. Serves 4.